The payoff, as with many of these types of campaigns, is personal reputation and bragging rights – but for the growing ranks of people for whom social media offers an additional limb upon which to balance their virtual identities this reputation is more important than money. It could be considered a simple journalistic effort to do this, but if you look at how the project has been executed, it offered a great case study on how to use the power of the Internet to engage people and build an audience online. Have a strategic message behind your campaign. The idea of seeking the most influential person online could have been done by any publication, but the fact that Fast Company has chosen to do it sends a strong message about how they want to be perceived: as the magazine that people who are highly influential online read. There are plenty of choices to fit this category, but Fast Company has long been one of my favourite printed publications that I actually subscribe to in print format and read every copy of cover to cover because of their dedication to merging the worlds of online and offline together to paint a picture of the future of business. It is why I have written for them before and why I often recommend the magazine to colleagues. Make it easy to spread the word. Core to this idea is the fact that every participant gets a shortened URL to use for their own bio. This URL is what anyone can use to pass along the promotion to their social network and is also the primary way that the site can measure your influence. 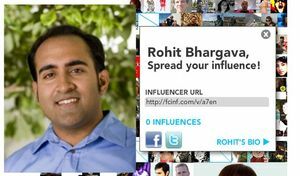 You can also integrate your Twitter and Facebook profiles, but unlike other promotions that can turn into popularity contests through the number of friends and followers you have – the Influencer Project is focused on actual action. The more clicks you generate, the higher your influence score. Support your promotion with your core business. In the case of Fast Company, their business is producing editorial content. Instead of just sticking a banner on their site and sending out some emails to their subscribers, they are also integrating the Influencer Project into their editorial by releasing a series of interviews with influential people online. 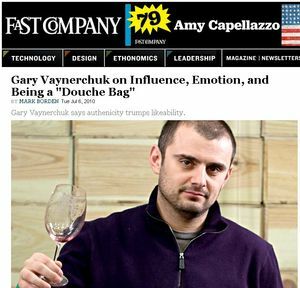 The first was with Gary Vaynerchuck and presumably the others they do will help add more context to the idea of influence online and take advantage of Fast Company's editorial voice as a way to bring more people into the Influencer Project. Have multiple payoffs to attract more participants. The ultimate payoff, as I noted above, is the ego stroke that having your photo appear larger will give and that will likely drive many people to participate. Fast Company will also publish a large photo in their magazine with a spread of all the participants as well – which adds a dimension to the reason for participating and likely will attract people for whom the online credit may not be enough. Integrate long term brand assets with a short term campaign. One mistake many marketers make is to drive a lot of attention and engagement around a short term effort without generating any longer term value for their brand. Fast Company has the Influencer Project, which will have a definitive start and finish, but they also integrate it with their branded Facebook and Twitter pages, which are longer term assets for the brand. By doing so, they can use the spike in activity around the Influence Project as a way to build greater long term value for their brand and a bigger base of engaged people that they will be able to promote content and activities to in the future. Update 07/07/10 – For more context on this campaign and how it attempts to track influence, check out Amber Naslund's great post countering Fast Company on how they are confusing ego with influence. She has a great point about how this is an overly simplistic and ego driven way to track whether people have influence online. Though I agree it is an incomplete metric in terms of influence, I still think there are many marketing lessons you could take from this effort as I talked about in my post – but I found her alternate take on the campaign made me think more deeply about it and I highly recommend you read her post and decide how you land on this campaign for yourself.